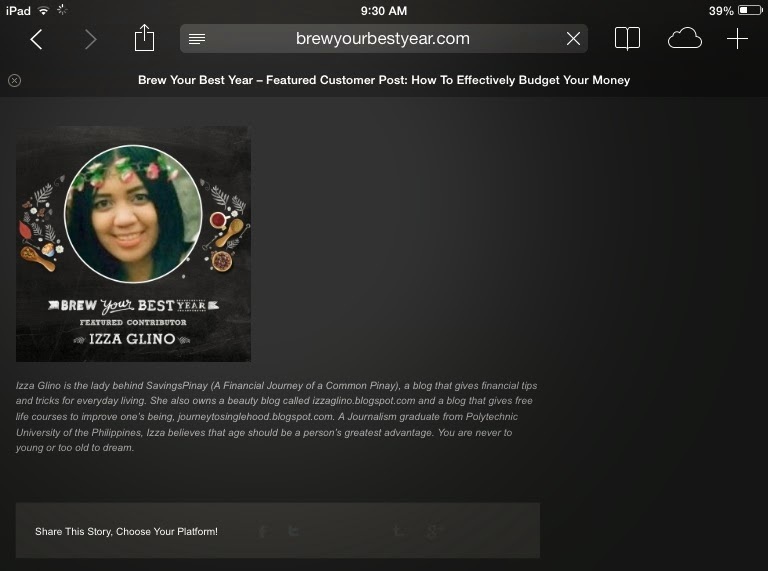 I am so thrilled and excited to announce that SavingsPinay’s How to Effectively Budget Your Money got featured in The Coffee Bean’s website, BrewYourBestYear!!! This is a major leap for this humble blog of mine. I want to inspire others to take advantage of their age for you are never too young or too old to dream. It is the core of why even if I have a very busy schedule as a full-time marketing assistant and part-time event specialist, I still find time to creates posts, publish them and market. And this little surprises, like being featured in another website, is just the very thing I needed to be amplified. Blog Features make me realize that I am doing something good thus I need to improve and be better. Sharing to you some screenshots!!! I hope you can follow SavingsPinay more. Visit my Facebook and Twitter pages. Also, activate SavingsPinay through RSS and receive my new posts straight from your inbox. Its faster and easier for you!